In today’s technology-driven world, a financial services organization’s ability to evolve the business quickly depends on the network. 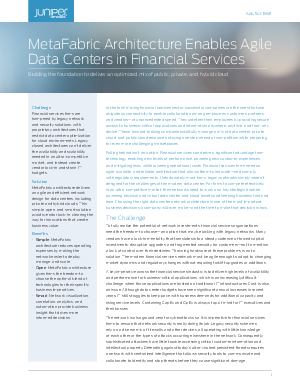 MetaFabric architecture, which is the foundation of Juniper’s unique end-to-end data center networking solution, helps financial services firms respond confidently to whatever happens in the market. With an open, simple, and smart network in place, organizations can adapt quickly and seamlessly to changing requirements while eliminating the disruptions of forced upgrades and unnecessary purchases that come with vendor lock-in. Most importantly, the MetaFabric architecture helps companies stay at the forefront of innovation, keeping them one step ahead of the competition.